It's day three of my Everyday Food. Great Food Fast recipe week. I'm featuring recipes that are easy to make everyday and are all in the same cookbook. So far we have had Turkey Meatballs, Cashew Chicken, now it's on to Pork Chops. I'm always looking for a new way to serve pork chops. I like pork chops - when they're not over cooked. I prefer pork tenderloin because the meat is easier to cook, and it's never dry. But Don really likes pork chops. Here's a recipe I found that is easy and has a nice fresh taste. As I'm looking at the recipe, I noticed they offered a few suggestions to serve it with. I think I'll try one next time. Either the Buttermilk Mashed Potatoes or Roasted Pear and Sweet Potatoes. Or, perhaps I'll make my all time favorite Parmesan-Smashed Potatoes from Ina. Yes, I think a little Ina and a little Martha is DEFINITELY a good thing. 1. Mince lemon zest; combine in a small bowl with parsley, garlic, 1/2 teaspoon salt and 1/4 teaspoon pepper. Set aside. 2. Heat oil in a large skillet over high heat. Season pork chops on both sides with salt and pepper. Cook in skillet until browned, 2 to 3 minutes per side. 3. Add 1/2 cup water to skillet; bring to a boil. Reduce heat to medium-low; cover, and simmer gently until pork is cooked through, 8 to 10 minutes. 4. 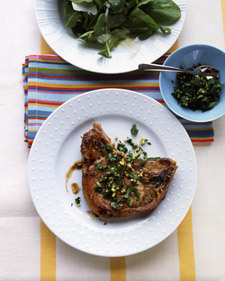 Transfer pork chops to a platter or serving plates; drizzle with pan juices as desired, and sprinkle with lemon-parsley mixture. 1. Place the potatoes and 1 tablespoon of salt in a 4-quart saucepan and add cold water to cover. Bring to a boil, lower the heat and simmer covered for 25 to 35 minutes, until completely tender. Drain. 2. In a small saucepan, heat the half-and-half and butter. 3. Put the potatoes into the bowl of an electric mixer fitted with a paddle attachment and mix the potatoes for a few seconds on low speed, to break them up. Slowly add the hot cream and butter to the potatoes, mixing on the lowest speed (the last quarter of the cream should be folded in by hand). 4. Fold in the sour cream, Parmesan cheese, the remaining salt, and pepper; taste for seasoning and serve immediately. If the potatoes are too thick, add more hot cream and butter. 5. 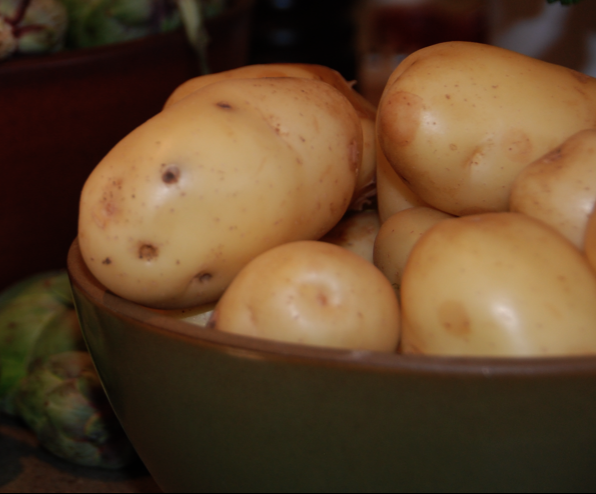 Spread the potatoes in an oven-proof dish. 6. Sprinkle top with grated Parmesan cheese. 7. Broil in the oven until golden brown. I decided I would have a theme this week. Everyone is always looking for good, easy recipes for every day. So I'm going to highlight some of the recipes from one of Martha Stewart's cookbooks. Cookbook: Everyday Food. Great Food Fast. I love this book. The recipes are easy and tasty. And there is a picture with every recipe. That's a good thing. Chinese food is really easy to cook. It's fast, can be prepared so it's healthy and tasty, and once you have basic asian ingredients in your pantry it's easy to make in a pinch. You can have the rice cooking while you make the chicken. I have all of the ingredients on hand except for the scallions. I also steam some broccoli so we have a veggie with the chicken. 1. 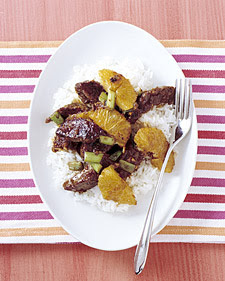 In a medium bowl, toss chicken with sherry, ginger, and 1 1/2 teaspoons cornstarch; season with salt. Let sit. In another bowl, combine broth, soy sauce, vinegar, sugar, and 2 teaspoons cornstarch; set sauce aside. 2. In a large nonstick skillet, heat 1 tablespoon oil over medium-high heat. Add half the chicken and cook until golden and cooked through, about 5 minutes. Repeat with remaining chicken. Transfer to a plate. 3. 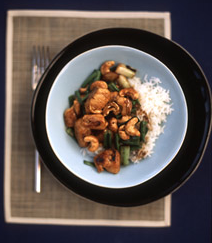 To same skillet, add 1 teaspoon oil, garlic, cashews, and scallion whites. Cook, stirring constantly, until garlic begins to soften, 30 seconds. Whisk sauce and add to skillet along with the cooked chicken. 4. Cook until sauce thickens, about 30 seconds. 5. Top with scallion greens and serve with rice. We like to serve our chinese food on fun square plates that I picked up at Cost Plus World Market and use chopsticks. If your kids are having trouble getting the hang of chopsticks, look for a hinge that connects the chopsticks for them. Here are some cute ones called Chopstick Kids. 5/1 - Update. Elli had her friend Lili over for dinner last night so I made this recipe. The girls loved everything but the scallions. Don and I enjoyed it with a nice glass of Merlot. I'm a huge fan of Martha Stewart. I have always admired her creativity, knowledge of food and all things domestic, and how she built her little catering business into the empire it is today. I looked past the snobby 'tude and just took in the knowledge she was sharing. 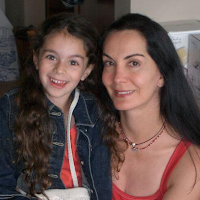 Back in the 80's my family lived in Weston, Connecticut right in Martha's backyard. My mom attended a luncheon that was catered by Martha. I don't know exactly what happened at the luncheon, but the story my mom tells is that everyone liked the food, but no one liked Martha. She was full of herself. Hmm. When I moved back to Connecticut in 1997 I became a bigger fan. I used to watch the show. I liked the old show that she shot in her Westport studio. It was more interesting to me when it was less glam. She would do the same things that she does now - it just wasn't as slick. I was really excited when she started the magazine. I wouldn't have to sit in front of the tv with a pad and paper to quickly write down the recipe. Now we have the internet to look up all the details. And she publishes cookbooks too. It just gets better and better. I subscribed to her Everyday Food magazine for a couple of years. But I couldn't keep up with the recipes - so I gave up. Now I just buy the book that condenses the good recipes from the year into one nice book! There are several recipes that I like in the cookbook Every Day Food. Great Food Fast that I make on a regular basis. The Turkey Meatballs recipe is by far the most popular. Everyone likes it and it's easy to make. I make a bunch of meatballs all at once. I set aside those that I want to eat that day, and flash freeze the rest on a cookie sheet before putting them in a ziplock. Now I have meatballs ready whenever I want them. 1. Make the sauce: In a large saucepan, heat 3 tablespoons oil over medium-high heat. Add garlic, and cook, about 1 minute. Stir in tomatoes, oregano, and thyme. Season with salt and pepper. Bring to a boil. Reduce to a simmer, and cook, covered, for 20 to 25 minutes. 2. Make the the meatballs: In a large bowl, whisk together egg, milk, 1 1/4 teaspoons salt, and 1/4 teaspoon pepper with a fork. Stir in onion, breadcrumbs, cheese, and parsley. Add turkey, mixing until combined. Form into 1 1/2-inch balls. 3. Coat a large saucepan with oil oil, turn on medium high. Brown meatballs until seared on all sides. Add meatballs to sauce, spooning sauce over to coat. Cover, and cook over medium heat until meatballs are cooked through, about 20 minutes. 4. While meatballs are cooking, bring a large pot of salted water to a boil. Add spaghetti, and cook until al dente, following package instructions, about 12 minutes. Drain pasta, and toss with remaining tablespoon oil. 5. 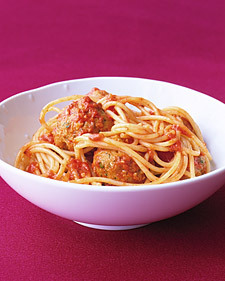 Add sauce and meatballs to spaghetti in pasta pan, and toss to coat evenly. Serve with additional cheese, if desired. I noticed this morning that we have four ripe bananas in the fruit bowl at home. Excellent! I'm going to bake Banana Crunch Muffins. I have a classic banana bread recipe from my mom's old cookbook whenever I want to make banana bread. But for muffins, nothing beats the Banana Crunch Muffin from the Barefoot Contessa. It's different from my banana bread recipe or regular banana muffins because they have extra stuff in them - granola, nuts and banana chips. Our friend, Greg Mitchell, used to ask me to bake him some in exchange for having us over for dinner. Worked for me! I love to bake. And we really loved eating Rawan and Greg's food. So it was a win-win. Unfortunately, they have moved out of the Bay Area. And we can't eat 2 dozen muffins before they go bad. So I wrap them individually in saran wrap and freeze them so we can have a fresh muffin anytime we want. They will last in the freezer for at least a month. I can already smell them. Anyone interested in having us over for dinner? Update.....I just finished baking the muffins. I substituted Macadamia nuts for the walnuts. And wow, they are delish. I think I'll do that from now on. I also don't use whole milk. I use 1% milk. Happy Saturday everyone! The office that I used to work in (in San Francisco) was right across the street from Houston's Restaurant, now known as Hillstone's. It's a great restaurant. The food is always delicious. The wine list is good. They even have Cakebread Sauvignon Blanc which is one of my favorite wines and wineries. I could have eaten there everyday. But I would be poor and fat. Because lunch is $20+ and the Spin dip, which is one of my favorites, isn't exactly low-cal. It's full of cheese, artichokes and spinach, served with chips, sour cream and salsa. Mmm, mmm, mmm. A few years ago I searched for the recipe. I found one that I think is as close as you get to the real thing. You can serve it in one bowl, or divide it up into ramekins, similar to the way they serve it in the restaurant. You can even put the extra ramekins in the freezer for another time. They don't last long though. The problem is, you can't stop thinking about that spin dip in your freezer, so you end up eating it for dinner. 1. Strain spinach and squeeze through a cheesecloth to remove as much liquid as possible. 2. In heavy saucepan over medium heat, saute garlic and onions in butter until golden, about 3-5 minutes. Stir in flour and cook for 1 minute. 3. Slowly whisk in cream and stock and continue cooking until boiling. 4. Once boiling, stir in lemon juice, hot sauce, salt and Romano cheese; stir until cheese has melted. 5. Remove from heat and allow to cool for 5 minutes. 6. Stir in sour cream, then fold in dry spinach and artichoke hearts. 7. Pour in ovenproof/microwave proof dish. Sprinkle cheddar evenly on top. 8. Heat in microwave or bake in oven until cheese on top is melted. 9. Serve hot with tortilla chips, sour cream and salsa for dipping. I can't believe it's been seven years since I went to the Food and Wine Festival in Aspen. Somehow, my boss at Einstein's, Joanne, convinced the powers' to be at Einstein's that three of us needed to go to the festival. Ha! Marketing girls from a bagel concept attending the Food and Wine festival - in Aspen. Uh huh. Well, needless to say, we had the most amazing time. We tasted wine, attended seminars, went to parties. We enjoyed every second of our trip. One of my memorable moments was watching Bobby Flay at his cooking demonstration. It was Saturday morning, about 10:30am. Everyone was a little tired and hung over from the night before - including Bobby. He stood there at the demo table and made himself a Bloody Mary. Then drank it - while all of us were sitting there with mouths dropped open, hoping he would pass it around. No such luck. 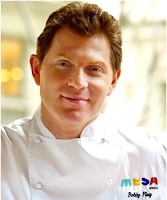 I didn't really know who Bobby Flay was at the time, and I have no recollection of what food he cooked. But I was instantly a fan. He was funny, easy-going, approachable and just a little bit cocky - in a good way. He didn't care that we were all sitting there waiting for him to cook. And we didn't mind. He was just doing his thing. Tonight I'm going to grill chicken and use his 16-spice poultry rub. mmmm,mmmmm. Can't wait. Whisk together all spices in a bowl. Keep extra mix in a glass jar in the pantry. Need spices? Check out my favorite place for spices Penzeys Spices. Update...... I have a confession. When I got home I started pulling out spices to make the rub when I remembered a new spice that I just got from Penzeys. So I decided to try that instead. It has most of the spices in the rub recipe - with a few changes. It's called CHILI 9000. 26 spices in all. It smells like chili with a hint of cinnamon. Elli didn't like it. Too spicy. I thought it was pretty good. No comments from Don. Which generally means it was ok.
Lucky for me, Don bought some home-made tamales from our friend Yessi up in Napa. 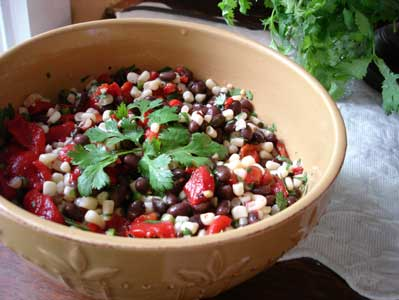 So I whipped up an easy Black Bean Salsa to eat with it. And we just heated up the tamales. The salsa is really quick and easy. Here's the recipe. Mix it all up and eat! Want it spicier? Add a jalapeno. Don't want to chop tomatoes or onion? Buy some pre-made pico de gallo and use that (that's what I did!) Want to give it a smokey flavor? Trader Joe's sells roasted corn in the frozen veggie section. Go figure. There are no rules with this recipe. Add what you like, delete what you don't like. I've added avocado before. I didn't have any cilantro yesterday. It tasted just fine without it. To roast the pepper put it in the toaster oven set at 400*. Roast until the skin blisters. Take out and put in a brown paper bag or foil for a few minutes. The skin will peel right off. Cut off the end. Take out the seeds and dice about the size of a corn kernel. Of course, like last night's dinner, this would go great with a margarita. Or a nice, cold, iced tea with lemon. We shop for fresh fish at Bryan's Fine Foods (a fish/meat market) in Corte Madera when we want to eat fish. I'm really picky about my fish. It has to be really fresh. If it smells fishy - it will taste fishy. No stinky fish for me! Which is why we go to the special market. We bought some swordfish steaks, marinated them in some of the sauce and grilled them. Wow. They were delish. Don grilled them for 12 minutes (6 each side.) They were perfect. To serve, pour on some more of the chimichurri sauce and serve with rice and a grilled veggie. We had some leftover mango salsa in the fridge so we topped them with that. Kids will like it too. Elli loves fish on the grill. She calls it chicken for some reason. Frankly, she can call it whatever she wants as long as she eats it. Enjoy with a chilled glass of white wine or a margarita on the rocks! I first posted this on 4/17/09. I believe it's time to repost this fantastic Mojito recipe. Here you go. Yeah, It's Friday! 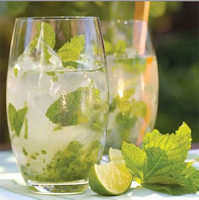 Time to hang out on the patio and enjoy a tasty Mojito with some spicy Caribbean cuisine. Don't worry if you're enjoying your spring break at home. You can still eat and drink like you're on vacation. So, invite some friends over, light up the grill and mix a batch of mojito's. I remember the first time Don and I had a Mojito. We were at a restaurant called Habana Bar and Grill in South Norwalk. They were really strong, but oh so delicious. The mojito pairs perfectly with Caribbean food, like grilled steak and chimichurri sauce. Here's a recipe from Michael Chiarello. He's not from the Caribbean - he's Italian. But he's an excellent chef and the recipe got a lot of positive reviews. I haven't made this exact recipe, but a chimichurri sauce is a lot like making pesto. 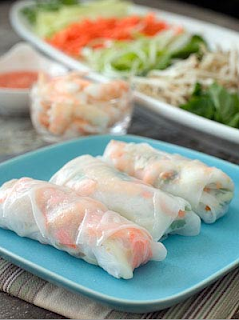 Super easy and always yummy. Here's a video on how to make the perfect Mojito. Give it a try and tell me what you think. If you're too impatient, here's the recipe. You really should watch the dude in the video make it though. crushed ice - "muddle the he-ll out of it". That's what the bartender says. In a tall glass add 1 oz fresh lime juice and 2t. sugar. Stir until sugar is dissolved. Add a little of the crushed ice so glass is 1/3 full. Stir. Gingerly, pluck mint leaves from a stem, then tear them in half and rub the glass rim so it's fragrant, then add them to the glass. Stir. Add 2oz white rum. Fill glass with ice. Top with a little bit of soda water. Add a straw. Enjoy. Make another one. Repeat as necessary. The favorite part of my job. When we moved to San Francisco my goal was to get a job in the wine industry. I interviewed with several wineries for marketing positions, but because of my lack of winery experience (drinking wine doesn't count) I didn't nab a job. Lucky for me, a headhunter called and I landed a job managing the BevMo! advertising account. It's been a challenge - but I've met some fantastic people, and have had the chance to try more wine than I ever imagined. Today I got to lead a wine tasting for a newsletter we're working on. I set up 9 wines, some crackers to cleanse the palate, water and notes. I recruited some of my co-workers to be the tasters. I'm pretty popular in the office on days like this. Wine tasting at 1:00 on a Tuesday? I didn't have any trouble finding volunteers. In fact, we had just as may appear at the door unannounced. I don't care. The more the merrier. There was plenty of wine to go around! Here are the wines we sampled. There were some clear favorites. Not a bad bottle in the bunch. And they all cost less than $13. The good news is, you can buy all these wines at BevMo! The bad news is, the only place you can buy these wines is BevMo! So if you don't live in CA or AZ you have to order online at www.bevmo.com. Don't worry, they ship, unless your state doesn't allow it. 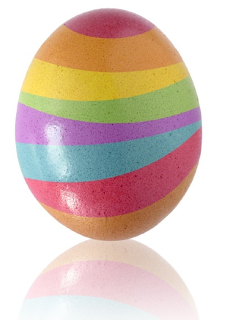 It's time to decorate easter eggs. Elli and I went to the store after school to pick up eggs and the Paas decorating kit. It took her 10 minutes to decide which Paas kit she wanted. She ended up picking out the basic kit. We plan on decorating the eggs in the morning, so I need to cook the eggs tonight. I never remember how long to cook them. I don't make hard boiled eggs very often. Actually, now that I think about it, I make them once a year - for Easter eggs. So I googled "Hard boiled eggs". And voila. I got what I was looking for with one click. I'm the only one in the house that likes hard boiled eggs. So I'll make one batch of egg salad. Yum. And throw out the rest of the eggs after they get lost in the back of the fridge. I like my egg salad with Hellman's light mayo, diced celery, salt, pepper and some celery salt on whole wheat bread. Mmmm. Can't wait for a sandwich on Monday. Happy Easter everyone! See you Monday. I started baking when I was young. My mom used to tell us that if we wanted cookies we would have to bake them. So we did. There is nothing better than fresh baked pastries. Plus, the house smells so good! I have a few reliable sources that I use to find new recipes. But sometimes they are staring you right in the face. Like the White Chocolate Macadamia Nut Cookie recipe on the Ghiradelli White Chocolate wrapper. They are some of THE BEST cookies I've ever tasted. Don asked me to stop making them. He could not stop eating them. They are seriously that good. It wasn't until I met Nancy Silverton, that I really started baking some really good stuff. 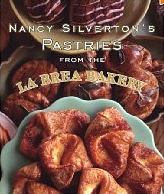 I got to meet Nancy, then owner of La Brea Bakery in LA, and author of Pastries from the La Brea Bakery at the 2001 Minneapolis Food and Wine Show. She demonstrated and sampled her breakfast bars and a savory tart. The taste of these pastries was amazing. I was inspired. I immediately bought the book. Got her autograph. When I got home I bought all the proper utensils and have never looked back. Her breakfast bars have become one of my specialties that I make every Christmas. They are sinfully good. Most of the things in her book are not easy to make, and they are definitely not low fat - but they are all soooo good. Which in my opinion, is what a baked good should be. I would rather give it up than use funky food substitutes. So you won't find any of that weird stuff in my kitchen. I've also been inspired from watching Martha Stewart. That woman knows her stuff. She taught me why you want good, quality ingredients. That eggs should be room temperature. The vanilla should be real vanilla. (I use Penzey's.) Chilling the butter is important. Dough shouldn't be over-mixed. I could go on and on. I don't always make everything from scratch. The Ghirardelli brownies you bake from a box are darn good. Elli calls them my famous yummy brownies. Elli helps me in the kitchen now. She's a future baker in training! I love when it's spring and we start grilling again on a regular basis. Here in California you can pretty much grill year round. But our grill ran out of gas a few months ago during the rainy season, so that was the end of grilling....until now. On Tuesday night we (ok, Don) grilled filet mignon steak, fingerling potatoes and zucchini on the grill. I prepped the potatoes, which involves nuking them for 5 minutes then slathering them in olive oil and spices until it's time to throw them on the grill. The zucchini gets sliced, and slathered with EVOO, salt and pepper. Let them sit for about 15 minutes before you grill them. The meat gets a heavy dose of steak seasoning before they hit the grill. 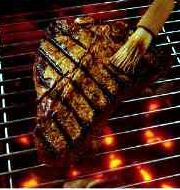 Then our secret weapon is from Steven Raichlen's grilling book. His tip for a "Steakhouse Steak"is to take it off the grill, add a pat of butter, wrap in foil, let sit 5 minutes to rest. The last thing I do is saute the mushrooms. I don't know about you, but I can't eat steak without mushrooms. I make them the same way my mom did. Slice one tub of mushrooms really thin (I use a mandolin) add 1 tB butter to a small saucepan, add the shrooms, then season with Lawry's seasoning salt. Saute for a few minutes. That's it. We opened up a bottle of Michael Pozzan Cabernet - and viola! Dinner is served. Everyone enjoyed it. Even Elli. She loves the mushrooms. Go figure! We gave her some ranch dressing for the zucchini. Which actually would have tasted really good with some horseradish added. For us. Not her. We have leftover steak for lunch tomorrow. I'm going to make a steak salad. Lettuce, tomatoes and steak. Yum. I have a confession. I'm obsessed with kitchen design. Really. How gorgeous is this kitchen pictured here. (It's not mine.) My husband thinks I'm over the top crazy. 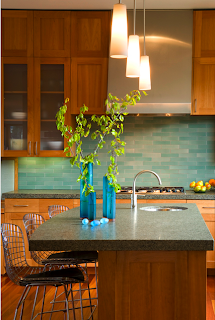 I love imagining what my kitchen would look like if I could gut it, expand it and start fresh. It's not healthy. It leads to constant disappointment every time I walk into my kitchen. My sister is gutting and expanding her kitchen. I am so jealous! This week I got my monthly email from Heath Ceramics. They are based here in the Bay area, in lovely Sausalito, Ca. They make some of the most beautiful tile. Use can use it on walls, floors, bathrooms, anything really. They have a portfolio of kitchens on their site. I love looking at them. So if you're in the market for tile, you should check them out. They also make beautiful dinnerware and vases. Every once in a while they have an open house where you get to tour the factory, paint a tile and get a free hot-dog. It's coming up May 8-10. Monday was opening day of major league baseball. Today is the first home game for the SF Giants. Bob, my boss, is going to the game - if it's not rained out. I don't know if Bob is excited about the game or getting his first ball park dog of the season. Hot dogs always taste better at the game. They're so good, sometimes you even want two. Bob loves them so much sometimes he goes to the game on his lunch break just to get a dog. The stadium is not too far from the agency, so don't judge him, yet. Don and I once did a hot dog tasting with our friends Gina and Peter. 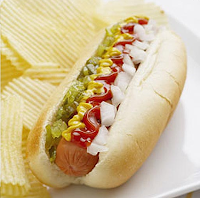 They bought all kinds of hot dogs and had all kinds of toppings - fresh tomatoes, pickles, celery salt, mustard.... I can't remember everything, but it was so much fun. I don't remember which one I liked. Too many dogs and too much beer. But who knew hot dogs could taste so yummy outside of the ball park? I do remember that I liked it topped with celery salt. Most of the time I just top it with a lot of plain mustard. Under and over. Don likes his with mustard, ketchup, relish and hot sauce. Elli likes hers naked cut up in pennies. How do you like your hot dog? I love strawberries. They're sweet and juicy. They are delicious plain or in a dessert. I have several great recipes that use strawberries. Strawberry Roll Cake, Berry Cobbler, Strawberry Romaine Salad (my mom's recipe), Strawberry Shortcake, Strawberries and cream....I could go on and on. So on Sunday I was happy to see a big feature in the Food section of the SF Chronicle that highlighted a great dessert, a Strawberry Tart. According to the writer it's the perfect dessert to end your Easter dinner. Why wait until Easter? Let's make it today!!! So I did. The tart is cooling in the fridge. It's going to taste amazing. I know this because I've tasted crumbs of the crust (yummy) and licked the spoon of the custard (double yummy.) It has to chill 45 minutes. I can't wait to eat it. Well, the tart was awesome. 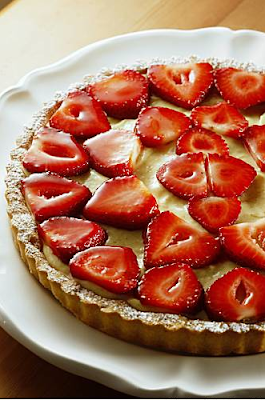 The crust was buttery, the custard was sweet with that great vanilla bean flavor and the strawberries divine. Email me if it's no longer posted on the Chronicle site. I saved it. Years ago, Don and I were lucky to go to Kiawah Island and Charleston, South Carolina on a business trip. We took a few extra days after the business was over and stayed in Charleston. What a cool city! We toured the navy ships and walked their charming streets. But the one thing I remember the most, was dinner at a restaurant called Magnolia's. I just did a google search and it's still there. They had the most amazing Southern food, presented in a beautiful way. Not big, huge, portions lumped on a plate. It was presented like gourmet cuisine. They serve a lot of their entree's on creamy grits. Yum -my. We tried a tuna filet for the first time. The waiter convinced Don to get the Tuna rare, that it will taste just like steak. He was right. It was amazing. While we were eating, a group of about 4 couples were in the bar waiting for a table. They were a rowdy bunch having a great time. The ringleader of the group was in charge of the drinks. He had a really strong southern accent. Everytime he said Bloody Mary - it was drawn out and sounded like Bluuuudy Mareh. We couldn't stop laughing. And of course we had to try a Bloody Mary. It was delish. Tomatoey, peppery, just perfect. I've tried to copy their grits over the years and never could get it right. I just discovered they sell their grits on their website. Now maybe I can finally make them right. My friend James loves the Sonoma Chicken Salad at Whole Foods. So I thought I would give it a try one day. I picked up a medium sized tub of it to bring home for lunch. I could not believe how much a little tub of chicken salad cost! It was 12 bucks. No. Way. I got home and tried the chicken salad. It was good. But jeez. 12 bucks? So I went on a hunt for the recipe. It was easy to find. Whole Foods has it right on their website. Yay! I decided to made it one afternoon to take to the beach for a picnic with Don and Elli. It was SO GOOD! Even Don liked it. And he's not a big chicken salad kind of guy. You have to try it the next time you're craving chicken salad. Here is my adaptation of the recipe. 1. In a bowl, combine mayonnaise, vinegar, honey, poppy seeds, salt and pepper. Refrigerate until ready to dress the salad. This can be prepared up to 2 days ahead. 2. Remove breasts from chicken and dice into bite-size chunks and transfer to a large bowl. Stir in pecans, grapes, celery and dressing. Viola. The best darn chicken salad you'll ever have. I have some cherry tomatoes sitting on the counter that I need to use before they go bad. They were on sale, buy one get the second free. Don questioned why I wanted two bags - claiming they always go bad. Which sometimes does happen. So now I need to prove him wrong and find a recipe to use them. I've been on a huge Sauvignon Blanc kick lately, and my very favorite Sauvignon Blanc is from Cakebread. They always have great recipes on their site. 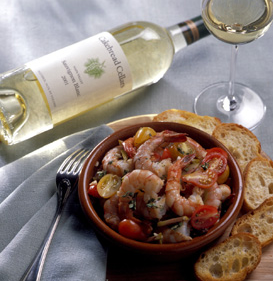 I found one that sounds easy to make, Broiled Shrimp with Cherry Tomatoes and Green Olives. Of course I will have to go to the store for shrimp and some great bread. Looks like I'll have to make a stop at Whole Foods on the way home. I'm always on the hunt for new wine. Usually in the under $20 price range. But I heard about a wine this week that got a 98 rating and is less than a hundred bucks! I'm seasoning the chops with Galena St. Rib Rub from Penzeys. They have the best spices. I used to love going into their store in Norwalk. Now I have to order online which isn't nearly as much fun as discovering stuff in the store. They have a rice recipe on their website that I think Elli will like, so I'm going to try that. Dinner will be quick, easy and delish. A Beaujolais, Chardonnay or Sauvignon Blanc will go with dinner. I'll have some of the Shiloh Road Chardonnay from last night. Don will probably want a Beaujolais. We'll see what we have. Well, the best part of dinner tonight was the wine! This one was a big miss for me. The rice had a really strong flavor from the bay leaves. The pork chops had great flavor, but were a little dry. Elli and I both thought it was ok. Don thought it was good. There are better recipes out there. We'll try another one next time.